After the last over 40 degree day my plants came through better than I expected. Now that the temperatures are a bit more comfortable for a few days I am digging more beds to put in a heap more vegetables. After mostly selling out at the Mt Gambier market I have found that I can probably sell as many vegetables as I can grow so I am going to see just how much I can grow. Here is one row of my heat stressed melons. 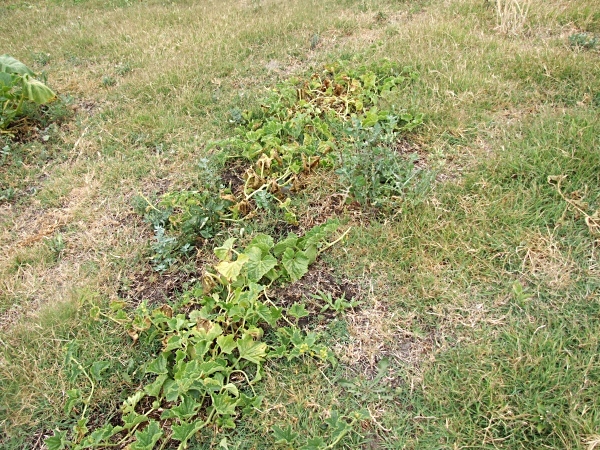 This variety is Krynychanka and I don't think it will recover so I won't get any melons this year. 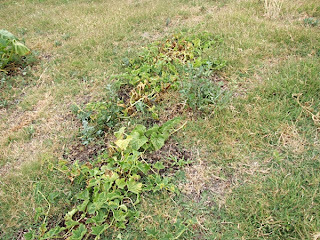 I have started digging beds in my P block where I have some melons and gourds but they aren't doing well due to weed pressure so I have a heap of room for more beds. I have put in some radishes and carrots but I will also be puting in some celeriac and witloof (Belgian endive) seeds today then more carrots as I get the beds dug, you can't have too many carrots,lol. Witloof is used like lettuce but is a bit more bitter so I hear. It needs extra work in forcing for the tender heads but I want to give it a go to see if it is worth it. I know it is the wrong time to plant it but I think I have enough time before the frosts to experiment.